Well I’m happy to say that I officially survived Week 1! I think that all things considered I actually did pretty well (but of course that’s up to you to decide). So on to my next challenge! It’s Lauren by Ralph Lauren and retails for $149. 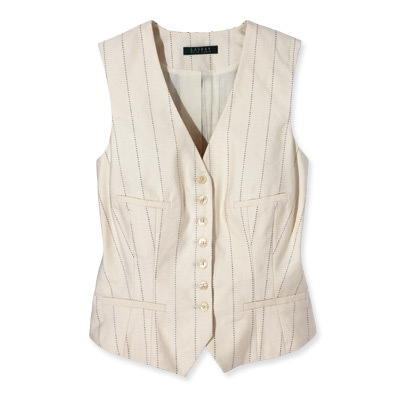 I have no idea how much the DSquared2 vest costs but it’s safe to say that runway=way more than $20! Although I think that the vest looks cute with shorts or a long skirt I don’t think that I’ll end up pairing it with them. I might wear the vest with shorts in a picture for the blog but I plan on wearing this challenge outfit to my PhD proposal defense and I think that my committee members might wonder if I’ve lost it (or if I’m looking for an easy pass) if I show up in short shorts! They will definitely know that I’ve lost it if I also show up not wearing a shirt under the vest (or they will think that my funding is now so meagre that I need to make ends meet “on the side”). A dress shirt under the vest is a must! 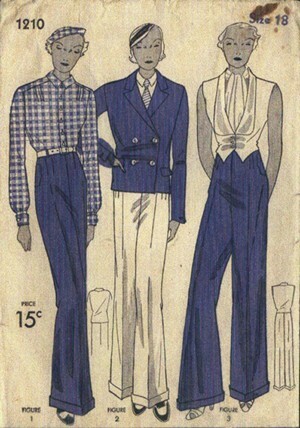 I found this vintage pattern on Etsy. I’m thinking the vest, a dress shirt, and trousers. I have the trousers but not the dress shirt so this ups the challenge a little bit. We’ll see how this week goes! I’m going to update the rules regarding eBay, online shopping, and what happens if I return something. Thanks for all your input regarding these little dilemmas I was having! For eBay and online shopping: the rules will be that shipping costs must be factored into the $20 and I must have the item of clothing by the Saturday end date of the week’s challenge, BUT I will allow myself one online shopping cheat where I can pay shipping on top of the $20 (the item must still arrive by the next Saturday though). For returns I will be able to pool the money from the returned item towards the next week’s purchase BUT I need to try my absolute best to avoid bad purchases.